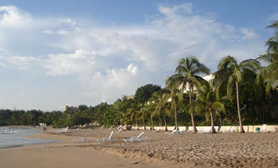 Playa Linda (Pretty Beach) is where the ocean meets the freshwater of Laguna Nichupté to create the Nichupté Channel. Restaurants and changing rooms are available near the launching dock. There’s lots of boat activity along the channel, and the ferry to Isla Mujeres leaves from the adjoining Embarcadero marina, so the area isn’t safe for swimming, although it’s a great place to people-watch, with a 300-foot rotating scenic tower nearby that offers a 360-degree view.